As for updated to iOS 8, iPhone users can easily set a timer on iPhone. Basically iPhone users set period of time on iPhone built-in clock app as countdown timer which it will stop playing music app when countdown end. With this features, iPhone users never falling asleep with music being played and wake up with depleted battery. Here’s how to set a sleep timer on iPhone to automatically stop music playback on iPhone. Launch the Clock app and then the ‘Timer’ tab on the bottom right of the display to set the timer. 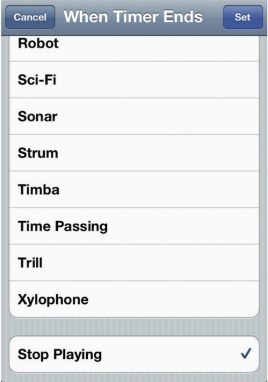 Tap on “When Timer Ends”, and in the list of ringtones, scroll down to the last option, you’ll see the “Stop Playing” option. Select “Stop Playing” option, and click set in the top right of the display. Click the ‘Start’ button to start play music (or a podcast or whatever) with timer. 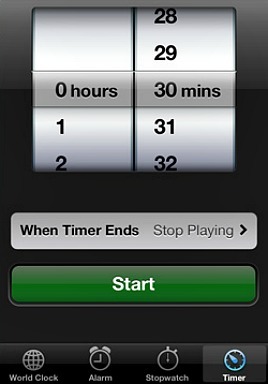 When the countdown is ends, any music playing on iPhone will be automatically stopped.